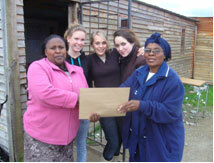 Our staff members were privileged to receive further training over the last few months. The topics were beneficial to their work at Masigcine as	well as to empower them in their home environment too. Lauren, our Social Worker, has sadly resigned. She was offered a career opportunity that she simply couldn’t refuse. We wish her the very best with her future plans. 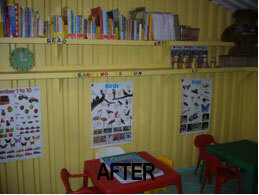 Our plans to convert the storage shed in our backyard into a suitable classroom for our young children to enjoy daily structured activities has	come to fulfillment with the help of many AVIVA volunteers, Lindile (our handyman); KIKX - Kuilsriver & Chesterhouse Private School	- Durbanville. This couldn’t have been completed without all your help. Classes will officially commence on the 1st December	under the guidance of a retired teacher and the help of the volunteers - Watch this space! In our last newsletter I wrote about our plans to redistribute the excess donations that we had received. Well, it gives me great pleasure to	report that this exercise of sorting the goods was completed and on one cold Friday afternoon, Jessica, Lauren, Ashley (all students from	Fairmont High); Anthea (Ashley’s Mom who kindly offered her bakkie( together with Lydia went to 8 EduCares in Mfuleni and blessed	them with toys,	clothing, books and shoes. A couple of our children have left Masigcine (Masithandaze and Wanda) to be with foster families and we are glad that we had the space to be a	place of safety for a couple of other little ones. Sana is little 5-year old girl who is a happy, smiling child and enjoys playing with the other	children. Our newest arrival is tiny Mario who turned one years old a few months ago. His development is very slow so we took him to a	pediatrician, Dr. Christie who referred us to a professor at Tygerberg Hospital. The diagnosis was not good … Mario has brain damage as a result	of his parent’s drug addiction and the likelihood of Mario ever walking is minimal. The staff and volunteers have been tremendous with him so much	so that even since his arrival just a month ago, there has already been an improvement in his reaction to movement and more smiles. It is very unfortunate that apart from all this good news that I’ve shared, I need to report that we have had some unsavory characters coming over our wall during the night who have stolen a number of things (two new bicycles; one of our rabbits with his hutch! ; our two large carpets that were left outside to dry; our hosepipe and some tools from the shed). These are all worldly things that can be replaced but we are so thankful that they didn’t tamper with the house or harm any of our children and staff. We had an electric fence installed on the perimeter walls of the Home and are extremely grateful to the company Voltage who gave us a 50% discount on the price! I’m very proud of all the staff at Masigcine - their love for the children; their dedication to their work and their loyalty to this Home is evident in how happy the children are. If anyone reading this letter would like to contribute towards us paying these ladies a bonus at the end of December, please mark your deposit reference with "staff bonus" and I’ll ensure that these funds go directly to this cause.